It was akin to throwing a shutout at Fenway Park or taking a championship game at Lambeau Field. In racing terms, a Southern 500 trophy won on the Labor Day weekend at Darlington ranked with those from the 500-mile races at Indianapolis and Daytona. But thanks to the schedule realignment in 2004, one of the best yardsticks for measuring the talent of stock car drivers is now gone. It’s disappeared into history like the Darlington stripe. The date and time of day were crucial to making the original Southern 500 so difficult to win as much as the egg-shaped track’s diabolical layout. Rising out of the verdant Piedmont plain of South Carolina, the track’s high banks turned into wicked, slippery slopes on invariably sweltering late summer days. The always-narrow groove became more elusive than a cool breeze. Missing the groove by more than half a tire’s width meant smacking the fence. Nobody knew the track better than Cale Yarborough, who grew up in nearby Timmonsville. As a kid, Yarborough snuck into the races. Sometimes the guards would catch him, throw him out and he’d sneak back in. Yarborough later started his first NASCAR Grand National event there at age 17 – one year below the legal limit at the time. But as the years went on, Yarborough’s eagerness to drive on the 1.366-mile circuit began to diminish, even though he eventually won five Southern 500’s. On a Labor Day weekend, one never knew as the miles unfolded if the leading driver was hooked up beyond reproach or just suffering from the rhapsody of driving a little too deep into the corners en route to eventually making a mistake and whamo! Judging one’s pace and line was never an easy task. As the cars became more purpose-built for racing, changing cross-weight in the chassis and tire pressures on pit stops occasioned by the inevitable late cautions – which bunched the leaders for a fresh attack – was a major challenge. The process helped separate the complete drivers from those who would be king. The Darlington rhapsody resulted from drivers imagining they were en route to a date with destiny, about to catch up with Fireball and Buck, Curtis and Herb, LeeRoy and Cale, Buddy, Bobby, Richard and David. When you outlasted everybody on a glistening day in Darlington, where sometimes you raced into a burning sunset after a rain delay, that was a piece of work. Nowadays there are some well paid people who know better who are telling us that 500 miles in the spring and finishing under the lights is the same thing. Shame on them. As if racing at Darlington in the cool of the night somehow matches up with winning on the track when the greasy groove was blacker than a boot and more slippery than snake oil. Changing times inevitably meant the disappearance of the Darlington stripe. The Armco barriers, used by drivers to gain speed by catching a car’s four-wheel drift at the tight exit of the old Turn 2, were replaced with concrete. More recently, those walls have been replaced by SAFER barriers, which provide a literal cushion for the occasional mistake as well as more safety. The late summer weather remains the same at Darlington. But gone is the yardstick that Terry Labonte, Tim Richmond, Neil Bonnett, Bill Elliott, Dale Earnhardt Sr., Harry Gant, Darrell Waltrip and Jeff Gordon had to measure up to. Almost all of the great ones eventually rose to the occasion. Mark Martin may not have a championship, for instance, but he does have a Southern 500 trophy. Good ol’ Darlington, in fact, could start or finish a lot of arguments. In the Petty vs. Pearson debate, one could point to the latter’s four Southern 500 victories compared to only one by Petty (during his all-conquering 1967 season) to confirm which was the better driver. In the debate over the relative youth and talent of Kyle Busch, I’d be more convinced about his talent if his Southern 500 victory last year in May had instead been posted during the late summer at age 23. As it stands now, Labonte in my mind is the youngest winner of the real Southern 500, which he captured at age 23 in 1980. If Busch wins a second straight this coming weekend — now that he’s just turned 24 — it will be impressive. But it’s not the same yardstick as winning after 500 miles on a day when the air is thick with humidity, the heat almost unbearable and the pressure to measure up to history palpable. Although it’s strictly a personal point of view, there might have been more than just realignment at stake when the Labor Day weekend date was moved from Darlington to the Auto Club Speedway in 2004. 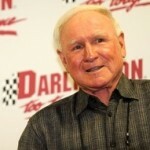 From the beginning, Darlington was a bit of a thorn in NASCAR founder “Big Bill” France’s side. In the 1940’s, when there were stock car promoters competing in every state on the Eastern seaboard, France had tried to convince Harold Brasington to build the South’s first paved superspeedway by expanding the France-owned track near Hillsborough, N.C. Instead, Brasington chose to throw his hand in with the folks at Darlington. The first Southern 500 in 1950 had to be co-sanctioned by NASCAR, because a local group had beaten France to the punch. Wary of a plan by rival promoter Sam Nunis in Atlanta to run the first 500-mile stock car race on the dirt mile at Lakewood, “Big Bill” pulled out all the stops to get a piece of the sanction at Darlington to bring enough drivers to thwart Nunis, who postponed his race until October. That struggle may have laid the groundwork for what came later. First, of course, France built his own superspeedway in Daytona, which opened nine years after Darlington’s first race. After almost a half century, moving the September date from Darlington to a track owned by the France family’s International Speedway Corporation in California was the last word on the scramble over which race stock car drivers wanted to win most. Currently, it’s all about the Daytona 500. Winning the Southern 500 at Darlington, which used to be on the same par as Daytona for many drivers, is no longer even close. Darlington’s 500-mile race was once part of the Grand Slam, which included the longest race at the four original superspeedways in the Southeast. Later, Darlington’s Labor Day race was the last leg in what was known as stock car racing’s Triple Crown, which started with the Daytona 500, then Charlotte’s 600-mile race. When the Winston Million came along, Darlington’s Southern 500 was the grand finale. All of these yardsticks of history were lost with the switch to running a lone 500-mile race in the spring under the lights at Darlington, previously the slot for a 400-mile event. This year the Labor Day weekend date has returned to the Southeast and the Atlanta Motor Speedway, because it turned out to be a flop in California. One of the reasons given for the problems at the Auto Club Speedway: the Californians considered the weather too hot for racing at that time of year.